Every generation carries the responsibility of caring for and passing on its knowledge to its youth. Arguably, we have never known such difficult times on so many levels. Yet possibility and resiliency seem intrinsic qualities of both people and planet. We cannot cease from efforts to change for the better. One of our cherished goals is to understand how and why we suffer; we explore who we are through our own mind and body on very profound levels, is a process of becoming less indifferent to our suffering and the suffering of others. 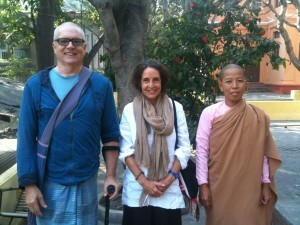 Our own inheritance of the 2,500-year-old transmission of Dhamma began nearly 35 years ago. An organic fusion has been unfolding ever since between revered Burmese meditation masters and some of the Western students to whom they’ve provided exceptional training. Now, we often teach side by side: Asian with Western, ordained monk/nun with lay person, classic traditional with contemporary style, male with female. This fusion is a powerful tension arc of complementary opposites and forges ways of teaching that offer precise practice styles according to individual needs within our community. We invite you to join us in this great practice and to see for yourselves what is possible for you.